State Rep. Matt Shea speaks out against Spokane City Council recognizing an Islamic Civil Rights organization. 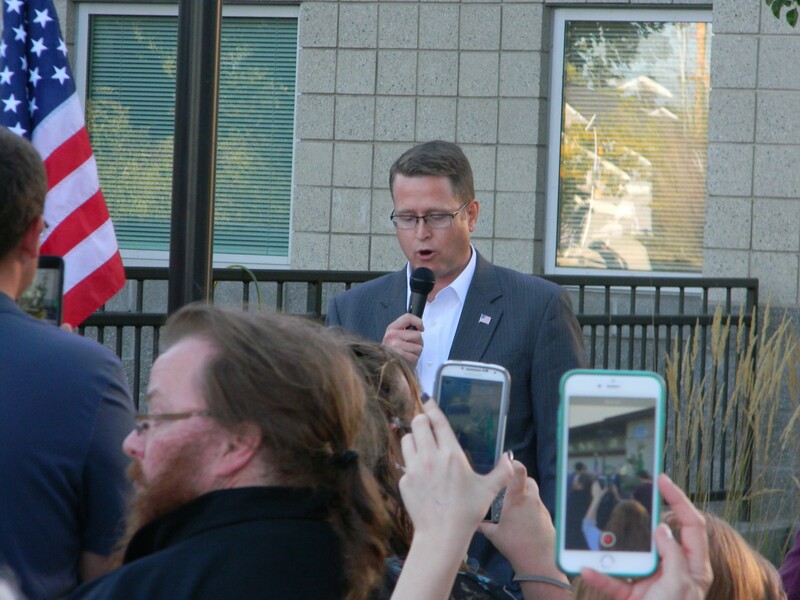 State Rep. Matt Shea, R- Spokane Valley, along with about 70 activists, some bringing guns and flags, came all the way out to Northeast Community Center to protest the Spokane City Council recognizing the work of an Islamic civil rights group and the local Muslim community. The rally, held last night, was organized by the Spokane chapter of ACT! for America, a groups that’s drawn concern from the Southern Poverty Law Center. 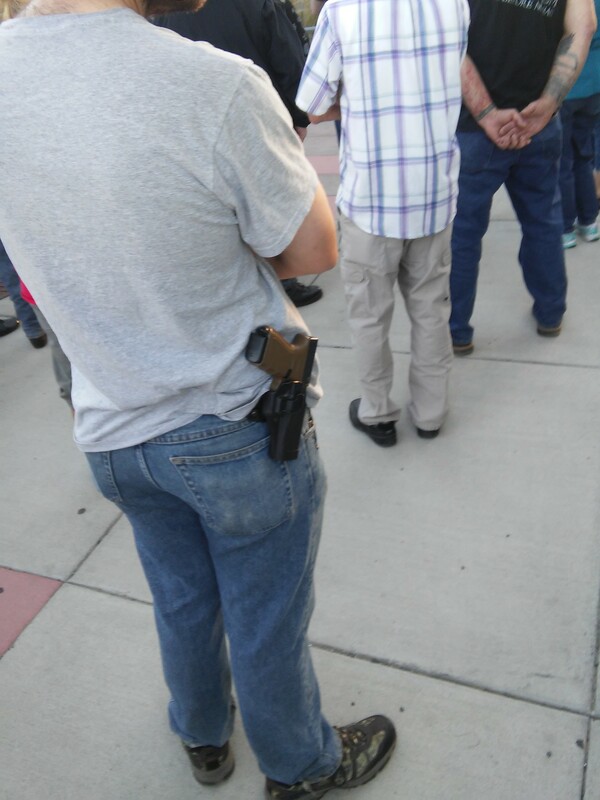 Some people came to the rally armed. Speaking to the crowd, Shea insisted that he didn’t have a problem with Islam, noting he made friends with Muslims while serving in the military in Iraq. Instead, he had a problem with the council recognizing the Council on American Islamic Relations, which Shea said has documented ties to terrorist groups, specifically the Muslim Brotherhood. 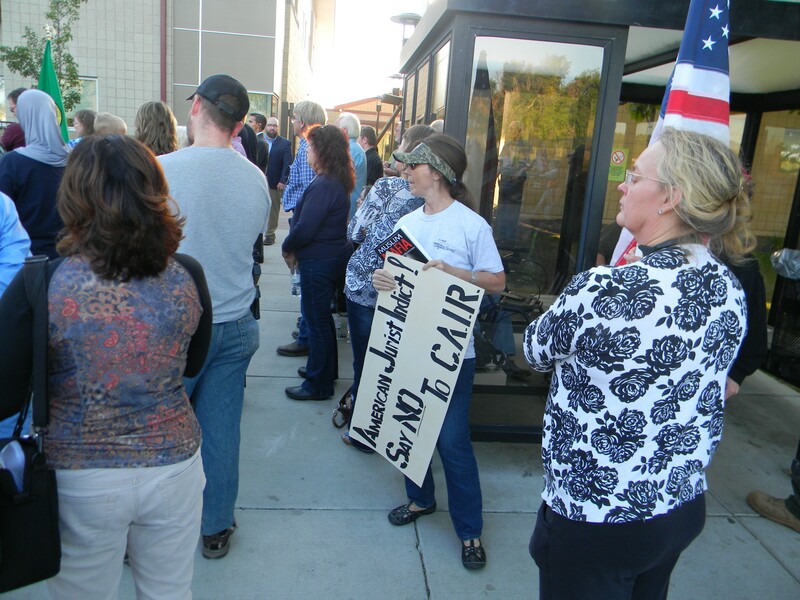 “I don’t think that an organization that in a court of law –– that has ties to the Muslim Brotherhood –– should be honored by the city of Spokane, do you?” he asked the crowd. Shea said that you can’t pledge allegiance to the Constitution and Allah, and the council, he added, should instead be recognizing men and women who serve in the military. The City Council normally meets in council chambers in City Hall. But this week, it held its meeting at the Northeast Community Center in a town hall format, which is designed to hear from local neighborhoods. The room was overflowing with people. People listen to Matt Shea speak. first open forum, where anyone has three minutes to tell the council what’s on their mind, so that they could spend more time hearing from neighborhoods and attend to other council business. Shortly afterwards the, council passed the salutation recognizing the work of CAIR to improve relations and understanding between Muslims and non-Muslims. “We’re here to celebrate America, our diversity and our common American principles of freedom, liberty and justice for all,” said Admir Rasic, a local Muslim, after receiving the salutation. As the meeting went on, people trickled out of the room. The council debated and passed its neighborhood notification ordinance, which requires to the city to notify neighborhood councils of large developments and makes it easier for them to appeal land use decisions. Stuckart said that he received emails earlier that day conflating the CAIR resolution and the ordinance. Some of these emails, he said, suggested that the ordinance would impose Sharia law on Spokane. The emails, said Stuckart, were some of the weirdest he’d ever received. 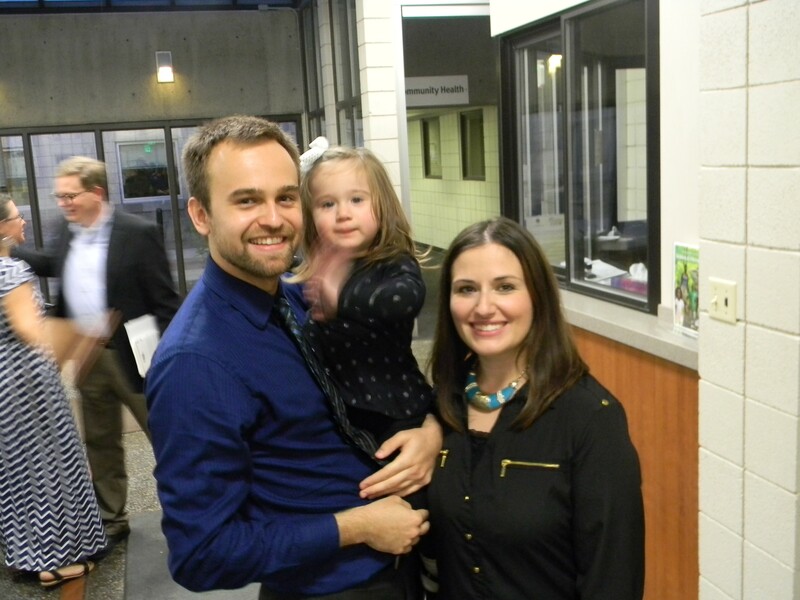 Admir and Azra Rasic and their daughter Najla, a local Muslim family, received a salutation from Spokane City Council last night.